Locals refer to this as Baggot Street Hospital. About a year ago this attractive building was put on the market for about €14 million with the expectation that it would be redeveloped as offices, a hotel or apartments. It was owned by the Health Service Executive and they were planning to use part of the proceeds to fund a new primary care centre in the south inner city. The Royal City of Dublin Hospital on Upper Baggot Street was built in 1832. Its facade is of red brick and terracotta tiles, set back from the street. The hospital was built to the designs of the architect Albert E. Murray in 1832. 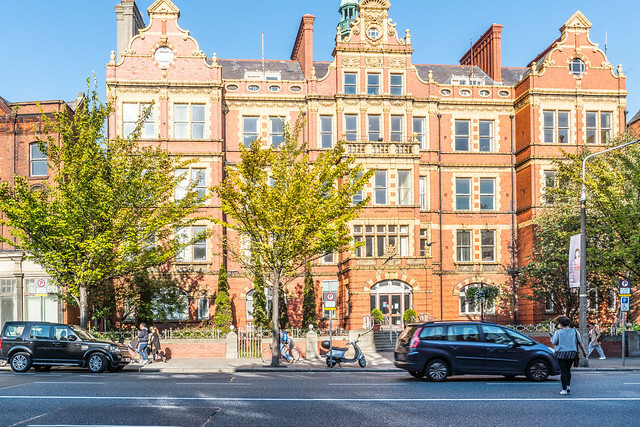 It was originally called Baggot Street Hospital and later renamed to The Royal City of Dublin Hospital in 1900.